General Contractor: Multi Tech Electric Corp. The precast concrete post tensioned foundation satisfied the design criteria and was installed in one day. 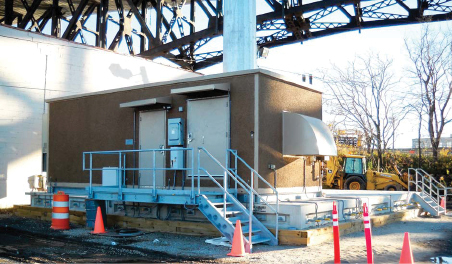 In 2015, AT&T required a 150-foot cell tower and a 28-foot-long shelter close to the Pulaski Skyway corridor (also known as US Rt. 1/9), near the NJ Turnpike connector. It was essential for the height of the antenna, at 150-feet, to be above the bridge. Oldcastle Infrastructure, engineering firm Maser Consulting and general contractor Multi Tech Electric Corp. partnered to complete the AT&T Communications cell tower project. The purpose of using a CELL BLOCKS foundation was to prevent any ground disturbance and to complete the project as quickly as possible. The monopole accommodates services for the lead carrier AT&T and for a future carriers. Designed by engineering firm Maser Consulting, using Oldcastle Infrastructure CELL BLOCKS, the foundation was designed to extend above the 100 Year FEMA flood elevation. To achieve the necessary elevation for the top of the precast foundation, a structural wood retaining wall surrounds a compacted granular material to a depth of approximately one foot. The wall also protects the long term integrity of the compacted material supporting the CELL BLOCKS foundation. Once the compacted material was precisely leveled and the alignment strings were set, the setting of the precast 15,000 pound precast concrete blocks proceeded. The pole block containing the anchor rods is located at the center of the 25 block layout. The anchor rods, hex nuts and templates were provided by Sabre Towers and Poles Inc. to the precast concrete manufacturing facility in Easton, Pennsylvania. Using 6000 psi concrete, the anchor rods were cast into the pole block with special steel rebar details and independently inspected. Post tension Grade 150 galvanized steel bars were inserted. Heavy steel plates and hex nuts were mounted on each end of the steel rods and hydraulic tensioning of the rods proceeded. Using post tensioned precast concrete CELL BLOCKS for this wireless facility demonstrated that the use of a precast concrete block foundation was extremely dependable, provided minimal interruption to the nearby business, provided no disturbance to existing ground and is removable in the future. No cast in place concrete was needed for this cell tower installation. We are looking forward to a bright future with this product line and design in the United States.